Distributed Indexing and QA for Teams – Work the way you want! The most efficient way to index and validate documents for distributed team environments. PSIfusion provides quality assurance and indexing capability from any compatible internet browser. PSIfusion is a secure way to process documents from anywhere. Ideal for teams that are spread out in several or many locations. The system utilises a team-level organisation with designated supervisors to maintain security and compliance, which makes the process of managing document queues simple and effective. With a built-in barcode generator and seamless integration with PSIcapture, PSIfusion’s true integration with PSIcapture, allows you to leverage all the complex capture functionality of PSIcapture in front-end processing and provides a simple, seamless route to PSIfusion export. View the video of PSIfusion on the right and see the simple and intuitive web based indexing options available to users making PSIfusion the product of choice for many distributed and multi site environments. Automatically queues documents that have been captured by PSIcapture. Authorised users are able to perform manual indexing or validate automatically extracted data. Processed documents are rerouted to the organisation’s ECM system. Why is Distributed Indexing and QA Important? PSIfusion is a secure way to process documents from anywhere. 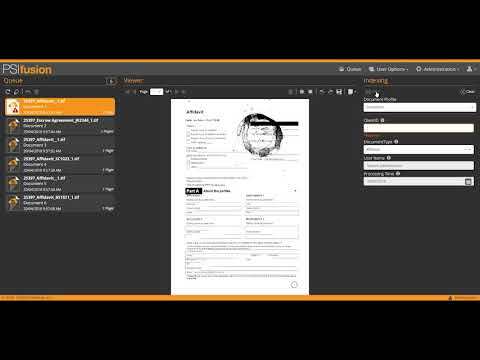 Ideal for teams that are spread out in several or many locations, PSIfusion queues documents that have been captured by PSIcapture to be accessed by specific members of the team. Authorised users are able to perform manual indexing or validate automatically extracted data, and then route the processed documents to the organisation’s ECM system. PSIfusion utilises a team-level organisation with designated supervisors to maintain security and compliance, which makes the process of managing document queues simple and effective. Built with native HTML5 under the hood, our state-of-the-art, one-team power solution extends distributed teams’ ability to work from anywhere—and offers dramatically expanded device and screen compatibility.